Overall crib dimensions: 30 3/4" x 41 1/4" x 29 1/2" Folded crib dimensions: 13" x 11" x 31 1/2". 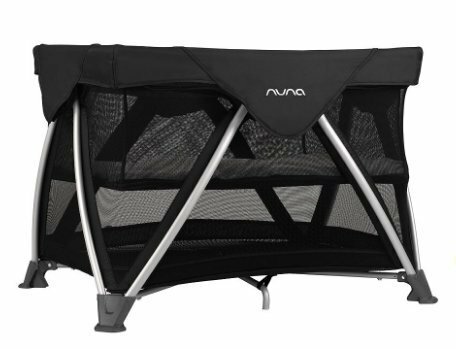 From Nuna: The Sena Aire Travel Crib features: The only cot whose upper cot folds with the frame; Mesh sides, floor and mattress combine to create the advanced air design, allowing air flow from every angle; Mattress's zip-off design is machine washer and dryer safe; Ventilated mattress pulls away both heat and humidity; Ventilated mattress panels easily remove for deep cleaning; No extras needed-even the organic sheet is included; A chic look-perfect for home and away; Unique zigzag frame pops cot open quickly and easily; Sets up and folds easily with one hand; The only playard with a bassinet that folds with the frame; Above-ground base keeps baby draft-proof; Skid-proof feet keep sleep quiet and still; Travel bag included with easy carry handle; Available in regular and mini size; Water-resistant; durable fabric resists stains, drips and tears; Mesh fabric sides; Eight leg design provides double the durability and stability; Sturdy, aluminum frame is easy to transport; Padded edges prevent finger pinches; Imported; Same revolutionary cot-now evolution-airy; SENA aire's advanced air design delivers maximum airflow for unparalleled relaxation. So easy and breezy, even its mattress has two different levels of ventilation. Oh-and its all machine washable. How's that for fresh thinking? Overall crib dimensions: 30 3/4" x 41 1/4" x 29 1/2" Folded crib dimensions: 13" x 11" x 31 1/2"
If you have any questions about this product by Nuna, contact us by completing and submitting the form below. If you are looking for a specif part number, please include it with your message.